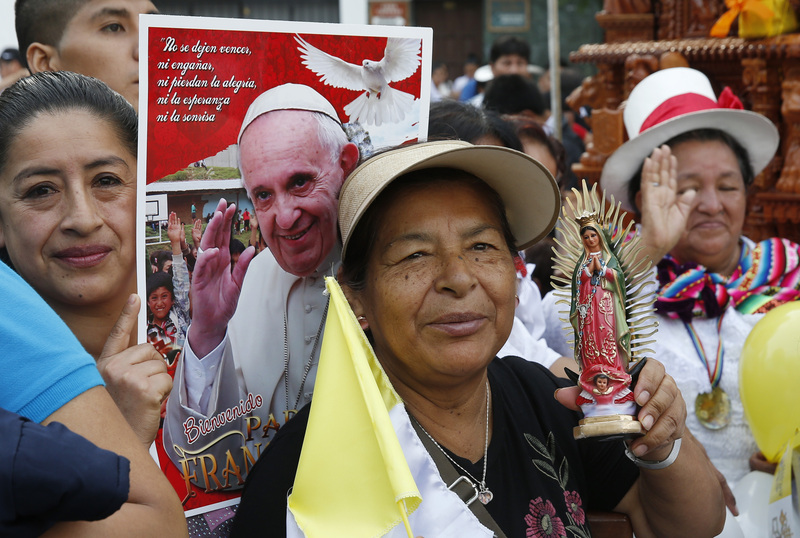 It was fiesta time in Lima on Sunday, Jan. 21, as Peruvians lined the streets of the capital city of 10 million people and cheered Pope Francis everywhere he went on this last day of his visit. There was an atmosphere of great excitement as he passed by; people cheered and chanted, “Papa Francisco, amigo, Peru esta contigo!” (“Pope Francis, friend, Peru is with you!”). He has clearly touched the hearts of the inhabitants of this majority Catholic country. On the two first big events of the day, the pope focused on the need for the church in Peru to be a united church, to a missionary church that reaches out to everyone and to be a prophetic church with the courage to denounce abuses and corruption against the people, especially against the most vulnerable. Francis, who appears to be enjoying his visit here more than in Chile, where the climate was much different, began the day with a visit to the Shrine of the Lord of Miracles, a sacred image of the crucifixion of Jesus. The image dates back to the 17th century and, having survived the ravages of time and earthquakes, has become an object of great devotion for all Peruvians. From the shrine, Pope Francis drove in his popemobile through cheering crowds, who were being sprayed with water by the fire brigade to keep them cool on this very hot day, and went to the 17th-century cathedral of St. John the Apostle and Evangelist. Inside, after praying before the relics of the country’s great saints, including St. Teresa of Lima, St. Martin de Porres and others, he addressed the country’s 68 bishops. Francis recalled that the saint “did not do this from a desk, and so he knew his sheep and they recognized, in his voice, the voice of the good shepherd.” The bishops of Peru, he said, should follow his example with their priests. In the final part of his speech, Pope Francis focused in on the crucial issue of unity among the bishops in Peru. He recalled that St. Turubius worked “in an admirable and prophetic way” to open ways “for communion and participation among the different members of God’s people” in his time. When Pope Francis had finished speaking, the bishops applauded warmly. The pope then engaged in a question-and-answer session for about half an hour. The pope ended the morning praying the Angelus with Peruvian young people and inviting them to get involved with the next synod, which will be this October and focus on youth. “Your faces, your questions and your lives are important for the church and we need to give them the importance they deserve,” he told them. Look to the saints of Peru as examples of hope and don't be discouraged “about ourselves or about others,” he told them, adding that things in life that are hard to accept cannot simply be digitally enhanced. Later that afternoon, before taking the plane back to Rome, he was scheduled to celebrate Mass for more than 1.2 million people at Las Palmas Airbase. Material from Catholic News Service was used in this report. This story has been updated.